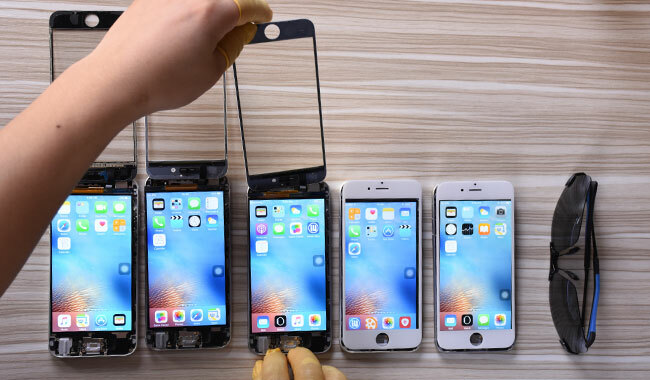 The supply chain of iPhone screen in China can be integrated with a diversified display assembly market. 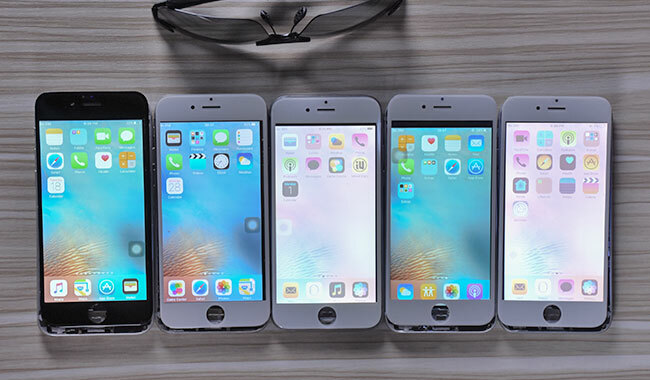 With the belief of “Quality Above All”, iphoneLCD.net has been working on the technical analyzing and test of diversified display assemblies all the time. 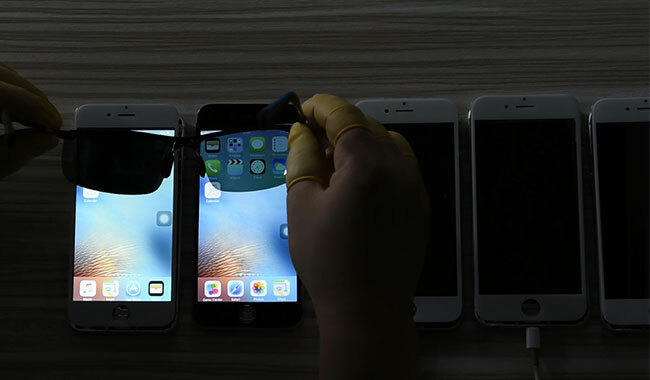 We will start with the black screen phenomenon resulted by polarized sunglasses and iPhone, or specifically speak, Aftermarket/China-made iPhone screens. 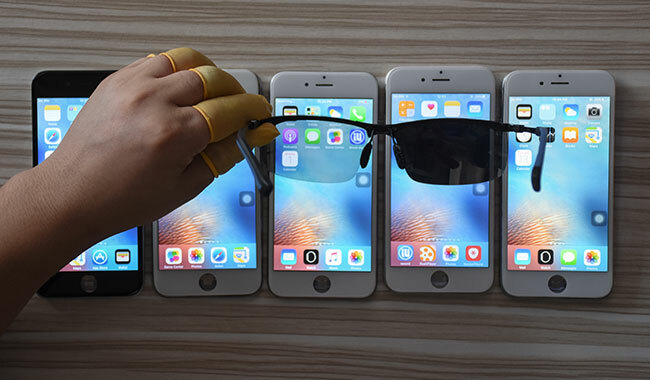 Let’s run polarized sunglasses and iPhone test and solution at the same time. 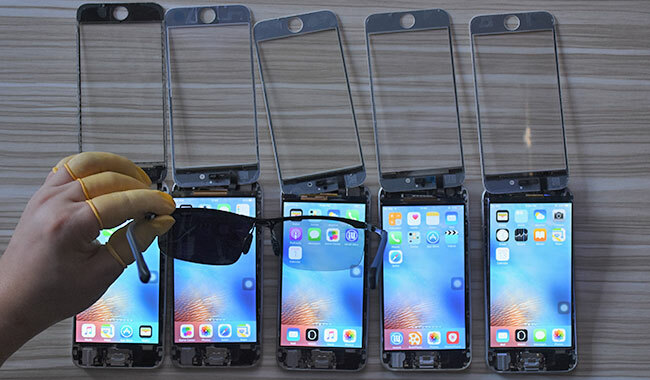 Five Aftermarket/China-made display assembly samples are applied in this polarized sunglasses and iPhone test and solution blog. Sample numbers from left to right: (a) (b) (c) (d) (e). Light the five screen samples. Test portrait screen with polarized sunglasses, sample (a), (c), and (e) display normally while sample (b) and (d) with black screens. 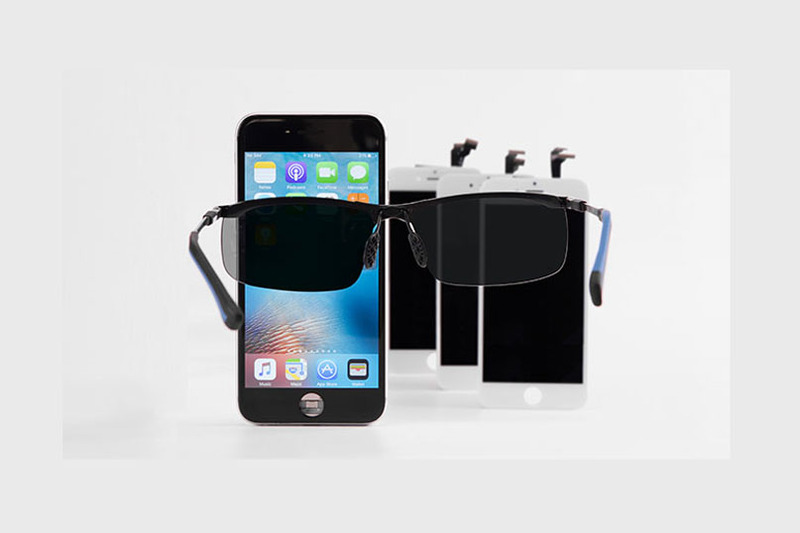 Test landscape screen with polarized sunglasses, sample (a), (b), and (d) display normally while sample (c) and (e) with black screens. Disassemble the touch screen assembly on the Heat Platform. Once disassembling process finished, distinguish the structure of the five samples, sample (a) features with G+F structure while sample (b), (c), (d) and (e) G+G. 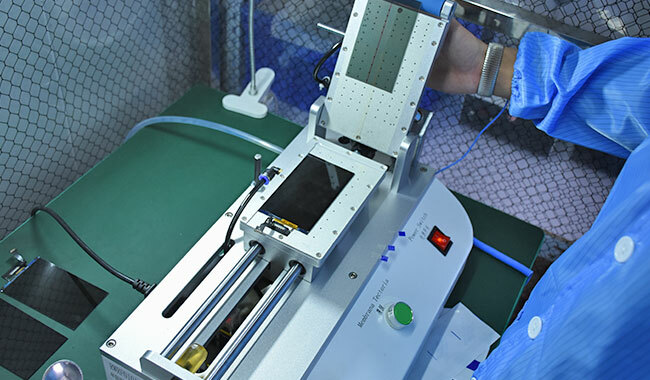 Connect the touch screen assembly with LCM module respectively, then light the five-screen samples. 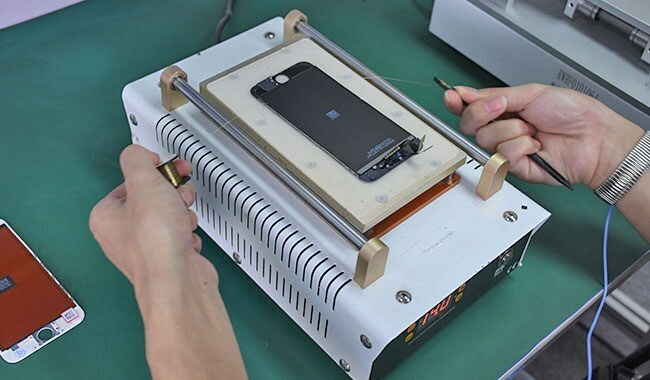 Remove the touch screen assembly and test LCM module. Test portrait screen with polarized sunglasses, sample (a)(b)(d) come with black screen while (c)(e) display normally. 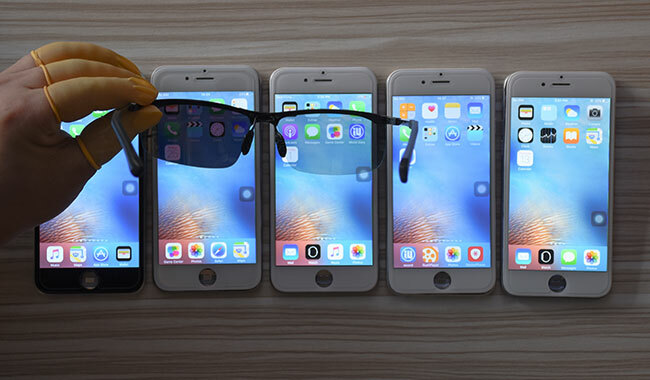 Test landscape screen with polarized sunglasses, sample (c)(e) come with black screen while (a)(b)(d) display normally. Sample (a) features (G+F) while sample (b)(c)(d)(e) (G+G). Cover the touch screen assembly of a sample (a) (G+F) over the LCM module of the rest four samples respectively. Then test with polarized sunglasses again. Both portrait screen and landscape screen of a sample (b)(c)(d)(e) display normally. 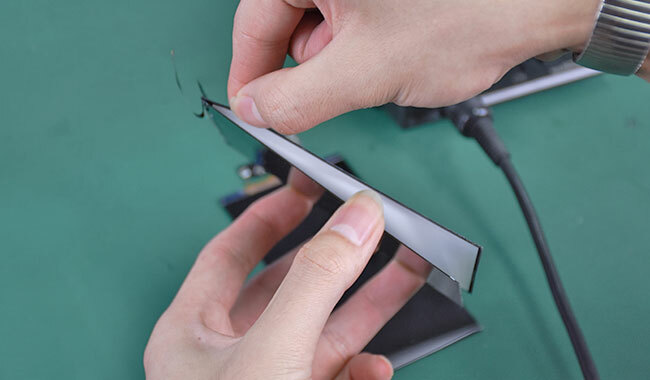 Exchange the touch screen assembly of a sample (a) (G+F) with a (G+G) sample and test with polarized sunglasses again. Test portrait screen with polarized sunglasses, sample (G+G) comes with a black screen while sample (G+F) displays normally. Test landscape screen with polarized sunglasses, both sample (G+G) and (G+F) display normally. 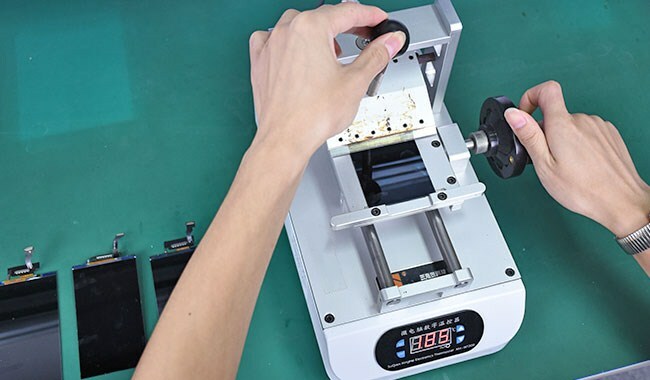 Use the Glue/POL Film Removing Machine to remove the front POL film of five screen samples. Use LCM Glue Cleaner to remove OCA residue and align new front POL film with the Laminating Machine. 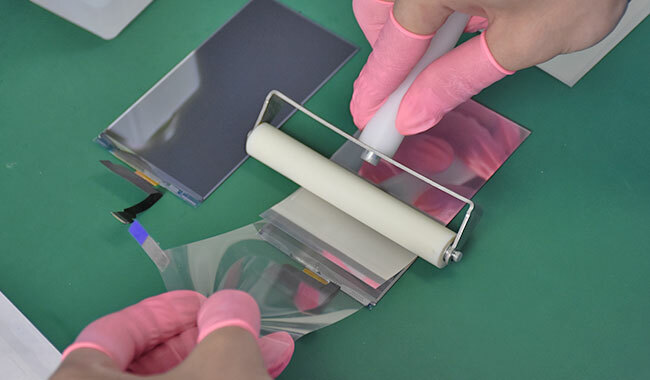 Once POL replacing finished, light the screen samples. 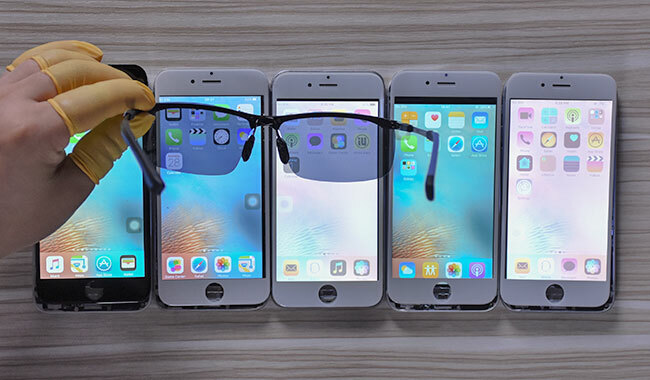 Before polarized sunglasses test, We can see with naked eyes that sample (c) and (e) display with discoloration. Test with polarized sunglasses, both portrait screen and landscape screen of the five samples display with no black screen. 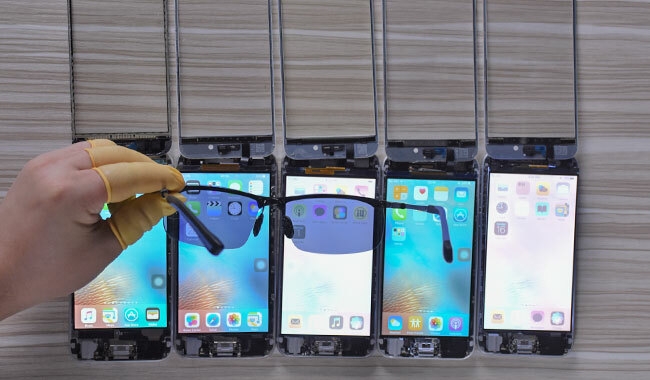 Remove the touch screen assembly and test LCM module with polarized sunglasses. Both portrait screen and landscape screen of the five samples display with no black screen. All LCD display assemblies come with two polarizing films, and co-working of the two contributes to the content displayed on the screen. The mismatching status of our replaced front POL film and the original rear POL film contributes to the abnormal display of sample (c) and (e). To fix it, we need to replace with a matching rear POL film. 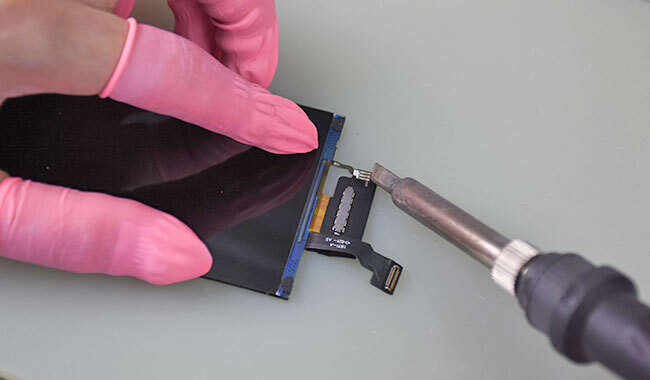 Remove LCM module backlight of a sample (c) and (e) and use the Glue/POL Film Removing Machine to remove the rear POL film of a sample (c) and (e). Remove OCA residue and align new rear POL film to sample (c) and (e). Once POL replacing finished, get sample (c) and (e) backlight assembled and then light all screen samples. Test with polarized sunglasses again. Both portrait screen and landscape screen of the five samples display with no black screen. Still, iphoneLCD.net also recommends a simple & easy solution for those in need. 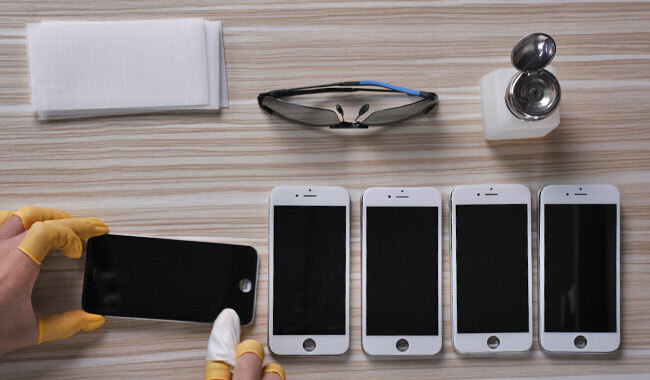 Prepare five new screen samples, brand to brand with the previous five samples. 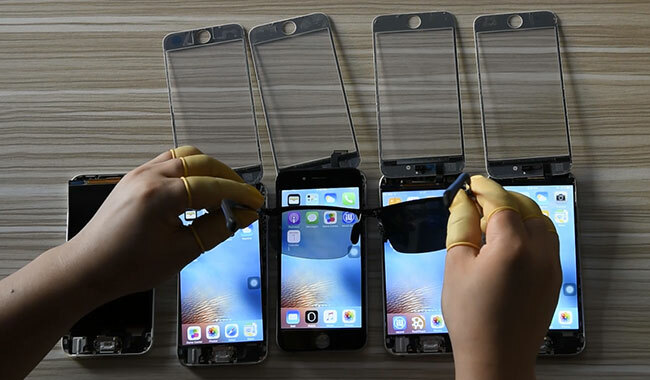 Adhere tempered glass to the five samples. Test with polarized sunglasses. Both portrait screen and landscape screen of the five samples display with no black screen. 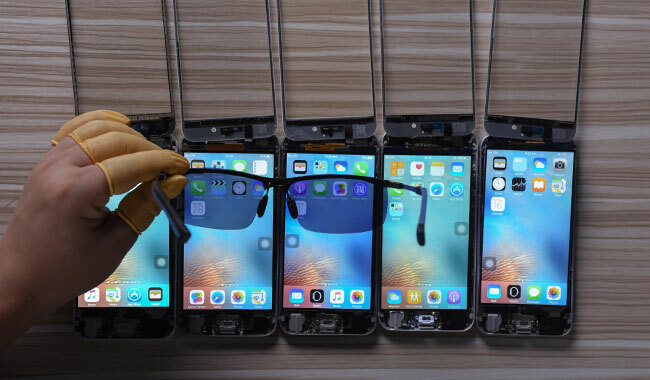 The black screen phenomenon of Aftermarket/China-made iPhone screens under polarized sunglasses is affected by the polarizing material of LCM modules and (G+G) structure of display assemblies. 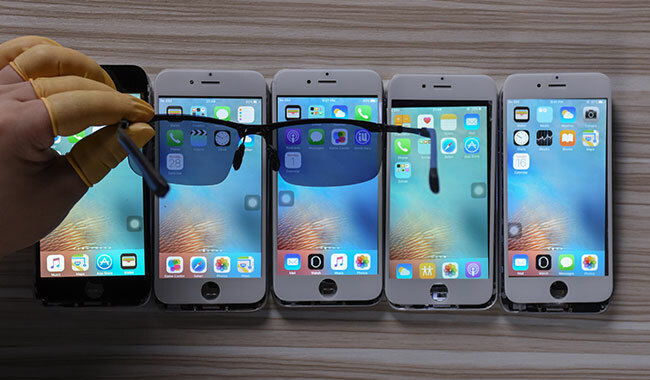 When the iPhone display light is perpendicular to the absorption axis of polarized sunglasses, the iPhone screen can hardly be seen (also known as a black screen). 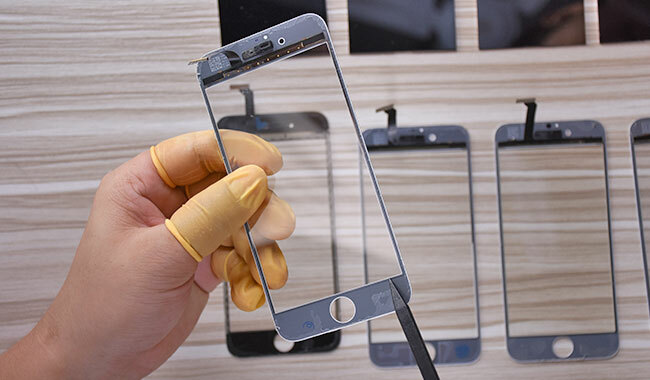 The easiest and simplest solution is to adhere tempered glass on Aftermarket/China-made iPhone screens.